We look for and act on (even if subconsciously) social proof in all areas our life – including how we behave and the purchasing decisions we make online. It doesn’t matter if that social proof comes from friends or strangers. What matters is that we’re seeing evidence from our peers – in this context, other consumers – that the decision we’re about to make is the right one. These recommendations can come in many forms. Word-of-mouth and third-party reviews come to mind, as well as what I’m focusing on in this article – testimonials. Testimonials are a type of review and social proof. They serve the same purpose (guiding potential customers and helping overcome objections), but they’re different in one big way: Testimonials are sought and selected by you. This means you have full control over which testimonials are used, as well as where and how they are displayed. We’ll look at ways to leverage testimonials in your content and other marketing materials; but first, let’s talk about how to get them and present them for maximum impact. The only way to get testimonials is to ask for them – but how? Randomly contacting customers to request a testimonial can work only to an extent. For best results, implement a system that allows you to request and receive testimonials at scale. Your product or service will be fresh in the minds of your recent customers so this is a great time to ask them what they think of their experience. Bear in mind that recent customers are only going to be able to comment on their experience with you up to this point. This isn’t a bad thing. Securing testimonials from customers at all stages of their relationship can help you address and overcome a wider range of objections. Use drip campaigns to automatically send emails to recent customers after a set time to secure their testimonial. Customers who didn’t respond to your initial email – Perhaps they hadn’t yet formed a solid opinion of your product or service and will be more receptive to a request for a testimonial later down the line. Customers who replied to your initial email with a testimonial – You know they’re receptive to your requests, so why not ask them for another testimonial now that they’re better acquainted with your product or service? You know your best customers are going to give you a great testimonial. Better yet, the simple act of reaching out to them personally will strengthen their relationship with you and your brand. It’s a huge win-win all around. Don’t just ask for “a testimonial.” Ask product- or service-specific questions that guide your customers toward writing testimonials that aren’t just complimentary but informative and inspirational as well. How much money did our product save you? How much time does our product save you each day/week/month? What’s the biggest benefit you’ve seen as a result of using our product? We know that a great testimonial should include specific product or service details, but what does this really mean? It means that vague statements like “great product” or “love it” don’t cut it. Instead, your testimonials should describe what is so great about your product or service and how it benefited your customers. Remember, too, that you don’t have to use testimonials in the exact format you receive them. Edit spelling or grammatical errors and feel free to paraphrase if it helps focus your message and maximize impact. Just be sure to send any significant changes back to the customer for approval before publishing the testimonial. Alongside the testimonial itself, include a name, date, and photograph of the customer who provided it. If possible, include a link to the customer’s website. This information all serves to help legitimize the testimonial. After all, which of these would you trust more? Now that you know how to collect testimonials and how to present them for maximum impact, let’s look at nine ways to use them in your content and marketing materials. A visitor that lands on your blog via an external source or through a link on your website is a potential customer. Including brief testimonials within your blog content (ideally in the sidebar so as not to be intrusive) can help attract the attention and interest of visitors who have landed on your blog by chance, and reaffirm your credentials to those who are there because they’re browsing your site. SEO author, speaker, and strategist Stephan Spencer uses a carousel to display a series of testimonials in the sidebar of his blog. Case studies are detailed analyses of specific instances or events. They’re an awesome sales tool in their own right, but they can be enhanced further with testimonials from the customers in question. Its placement helps legitimize the case study and adds weight to the claims made. These pages play a key role in creating leads and driving conversions. If you’re not including testimonials here, you’re missing out – big time. In fact, don’t stop at product and service pages. Include testimonials on your home page, About page, and contact page. Basically, any page that could realistically play a part in driving conversions should be enhanced with a testimonial. That said, don’t just stick any testimonial on any page of your site – make sure each testimonial is relevant to the page. That means using general “this company/person/product/service is so great” testimonials on your home page, and placing testimonials praising specific products or services on those corresponding pages. Use testimonials to help drive conversions – whether a business inquiry, an email sign-up, or a content download (or all three) – by including short testimonials next to your calls to action. 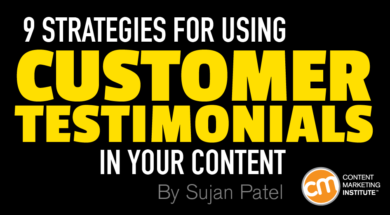 This is one of the most important places on your site for using testimonials. A testimonial could be the trigger needed to overcome a potential customer’s final objections and get them to buy. 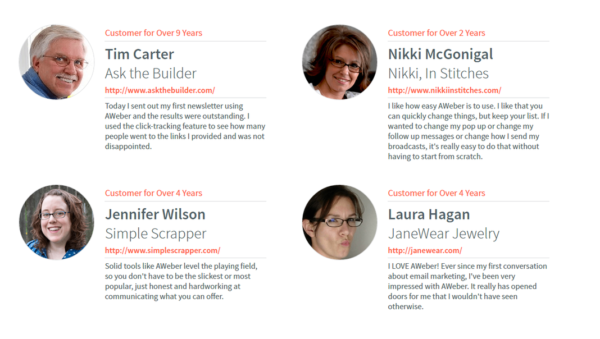 Just don’t forget to match contextually relevant testimonials to the page. Print marketing materials often take a back seat to their digital counterparts. That’s understandable. Digital campaigns are generally easier to measure and are more cost-effective than print campaigns. If you’re sending print marketing materials, add weight to your sales messages by including relevant customer testimonials. Enhance drip campaigns used to nurture leads with relevant testimonials. To maximize their effectiveness, match testimonials to the primary objection each email aims to overcome. The campaign itself is for a course designed to help start-ups get better at sales. At the bottom, you’ll spot a testimonial from someone enrolled in that same course. What you’ll notice, however, is that the testimonial doesn’t push (or even mention) Close.com’s products. Instead, the testimonial reinforces the value of the course and consequently addresses the objection subscribers are most likely to have at that point: whether or not the course is worth continuing with. This example highlights the importance of matching the most appropriate testimonial to your marketing materials rather than simply using the one that pushes your product or service the most. In this example, the testimonial in question encourages “students” to stick with the course and, in turn, become more affiliated with the brand. The result is a highly qualified lead that’s far easier to sell to later in the campaign. Whether you’re using social media to promote your content or to push your product or service, testimonials can help you boost clicks and conversions. 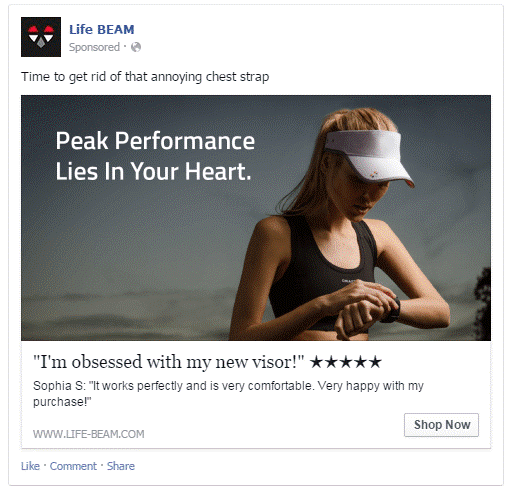 This ad from Life Beam uses part of the ad text to highlight a short customer review. Alternatively, you could include a testimonial within a post’s image. Just bear in mind the limits on the amount of text in an image used in a Facebook ad. You can check whether Facebook will allow your ad to run using this tool. Testimonials don’t have to be written. Why not collect audio or better yet video testimonials? Sure, they’re harder to get, but they’re more personal and feel far more authentic. Consequently, they’re widely regarded as being much more effective than their text-based counterparts. They’re also great for promoting on social media (and you don’t have to worry about rules that dictate how much text you can or cannot include). Or, instead of asking a customer to speak directly to the camera, get on camera with them, and interview them about their experience with your brand. Prep the customer – Creating usable content will be quicker and easier if the customer knows ahead of time what you’ll be asking so they can begin to formulate their answers. Keep it brief – This is a testimonial, not a documentary. Three questions should suffice. Edit properly – Even a three-question interview can drag if the customer’s a big talker. Edit out any irrelevant chatter so only the most important information – information that’s going to help potential customers overcome objections and decide to buy – remains. While I strongly urge you to include testimonials across your site and in other online and offline marketing materials, a page that rounds up all your testimonials or a cross-section of your best ones can be an invaluable asset for both you and your potential customers. This need is even greater if your products or services don’t fit third-party review sites. Potential customers who are on the fence about getting the ball rolling will want to see as much evidence as possible that working with you is the right choice. Make that easy for them by collating your testimonials onto a single page. How do you use testimonials? If you have a minute to share your experiences, I’d love to read about them in the comments. Want to learn more about social proof in the buying process, how to create the best content, what to measure, and much more? Subscribe to CMI’s free daily or weekly digest newsletter.